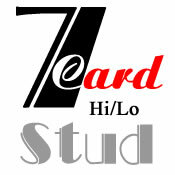 Stud 8b is a popular game in the 7 card stud poker family. It is the split pot version of its cousin seven card stud. Like in Omaha HiLo, you will either be going after the highest possible hand or the lowest, with a requirement on the low. Overall it’s a really popular game and very fun to play. In Stud 8b you will be take your high hand and your low hand, if it qualifies and try to win at least one pot and possibly even both pots. To qualify for low, a player must be able to play an 8-7-6-5-4 (8-6-4-2-A) or lower in any variation (this is why it is called “eight-or-better”, or simply “Stud8b”). If there is no qualifying low hand, the high hand wins (scoops) the whole pot. A ‘scoop’ can also take high hand and low hand. Dead Cards – In any stud game you have a lot more info at your disposal, namely, the dead cards. Keep track of the cards that have been shown and you will have a HUGE advantage over the other players. It’s very difficult to remember each and every card, so concentrate on remembering those cards that either you or your opponents may have needed- straight cards, flush cards, dead low cards, etc. Fluid Position – In stud, position can and does change with each round of play. Keep in mind that raising for a free card when you are in late position may backfire if you pair off and are suddenly in first position. Experience alone will help you understand position in stud games, it’s very difficult. Because most low limit stud players are too loose, you can beat that game by simply playing much tighter than your opponents – this will be the basis of your strategy. If you aren’t sure what the best starting hands are, here is a good list to use. I would stick to playing mostly just these if you are a new player to Stud 8b. Stick to this Stud 8b guide and don’t play anything better until you have had some experience. Playing more hands will just get you into trouble and cause you to lose the winnings you earned while playing your good hands. First and foremost, PLAY TO SCOOP. You want to win at least 75%, but hopefully the whole pot. Hands that have two way potential can be played much more strongly than one way hands, even if you’re behind in one or both directions. Do not draw to second best hands, if you’re drawing to a low, be sure that it will be the best low if you make it. Don’t draw to a straight when someone else looks to be drawing to a flush, etc. The exception is if you’re playing for both ends. If you have a low straight draw to an 8 high straight and there appears to be a flush draw and a better low draw out there, go ahead and play it. Becoming aggressive with this hand could even knock some of the others out of the hand before showdown. Some hands do better heads up, while others do much better multiway. Big draws to low straights and flushes like big multi-way pots. Pairs, aces, kings, queens, and low pairs with an ace, do better heads up- try to thin the field with strategic raises on third and fourth- remember, you want to win the whole pot. Use raises throughout the hand to knock out other hands if a good opportunity arises. You really want to knock out the low draws if you’re going high (so you can win the whole pot) but it’s also very important to raise to knock out other draws going the same way as you. If you have a high pair and someone else appears to be drawing at a straight, make them call two bets for the privilege. Remember that until it is made, even a good low draw (such as 2357) is behind even a pair of queens or kings. You don’t want to be heads up against a high hand if you only have a draw to half the pot. Fold and save a few big blinds. Once it is made however, you will often be free rolling for the high end- be very aggressive and try to win the whole pot. Slowplaying is generally a bad idea in loose stud/8 games. Don’t do it unless you have a high rolled set or another real monster (I would slow play a wheel unless it looks like flush draws or trips are out there). Do not let players draw on free cards. Take free cards but never give them out, especially on 5th street. As with most poker games, be tight & aggressive. Check-raising and three betting are very important in stud /8. The pots should be bet at a lot if there are good players at the table, but don’t be afraid to jam them yourself if you think your hand is a lock one way or both. It is a bit difficult to find Stud 8b games online for US players. The most active room with about 20 Stud 8 players is Bodog and they are mostly at the micro stakes games, such as $0.10/0.25 and $0.25/0.50. Bodog has been a well known poker room for many years and is famous for their sportsbook. The sportsbook is also where most of the fish are coming from, which is why Bodog is known for the "casual player" features such as anonymous tables and not allowing PokerTracker or a HUD. You can sign up today and receive a first time deposit bonus up to $1,100.